Many of us have felt discouraged and uneasy due to the words and actions of the current White House Administration. Those of us in the LGBTQ communities, along with our allies, have particularly experienced concern about the increasingly divisive, bigoted, partisan rhetoric we hear on a daily basis. The Pride season offers up an opportunity to feel connected, supported, energized and uplifted. 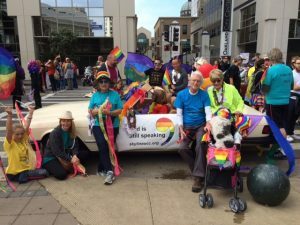 On September 9th, join us at 14th Street and Clay in Downtown Oakland, as we unite with our friends from the various United Church of Christ congregations in the Bay Area, for the 2018 Oakland Pride March. Families, children, pets, those of differing abilities, races, religions and statuses…. all are encouraged and welcome at this event. On September 16th, make your way up the hill to our sanctuary at 12540 Skyline Boulevard for our annual Pride Sunday Service. We will celebrate the history of the resilient rainbow spirit and the unique gifts of the LGBTQ community and beyond, with special music and artistry from throughout our community. All are appreciated and welcome!